With the federal election nearing, the polls currently show that Australian Labor Party (ALP) is on track to win. If they do win, at the top of their agenda is property tax changes. The ALP is proposing to reform negative gearing and the capital gains tax discount. They plan to limit negative gearing to new housing and halve the capital gains discount from 50% to 25% after a yet-to-be-determined date. The proposed tax reforms may achieve some of the ALP’s objectives, such as addressing the fiscal challenge and strengthening the Commonwealth Budget position. However, a report done by RiskWise Property Research and WargentAdvisory says it could also have unfavourable consequences on property markets, particularly locations with weak or fragile property markets. The report suggests that the ALP’s proposed tax changes will result in declining dwelling prices or price deceleration in some regions, a reduction in dwelling commencements, and deteriorating rental affordability in some locations. To implement the negative gearing and capital gains tax discount reforms, the ALP plans on taking a blanket approach across Australia. One of the main findings in the report was that a blanket approach would result in unintended consequences such as a 1.15% increase in interest rates in Sydney. Other cities that have weak or fragile property markets such as Darwin, Mackay, inner-city Perth, and Townsville would be more negatively affected. 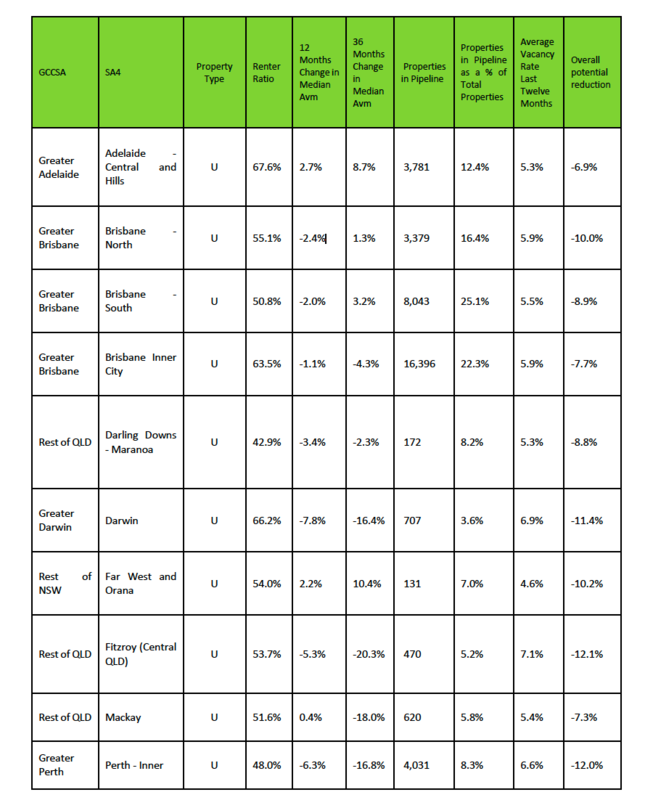 The below data was taken from the RiskWise Property Research and WargentAdvisory report that shows the top 10 local government areas that would be affected if Labor’s planned property tax changes went ahead. The report also found that the proposed reforms could lead to a reduction in dwelling construction contrary to ALP’s confidence that limiting negative gearing to new dwelling supply would encourage it. The report adds that based on the current supply and demand patterns, the proposed changes will again result in expensive housing prices. Unless measures are taken to uplift new dwelling supply in cities where the demand for rental housing is high, e.g. Sydney in Melbourne, limiting negative gearing will have negative results in dwelling constructions as the prices decline. This price weakness will, therefore, discourage investors from increasing affordable rental supply. The report from RiskWise Property Research and WargentAdvisory suggest that a strategy that motivates the construction of owner-occupier appropriate dwellings 10-20 kilometres from the city centre should be implemented. LGA or local government area targets gauged against projected demand should be included. The report also suggests increasing housing around key public transport corridors and train lines that provide access to key employment markets. Stamp duty exemptions for first home buyers and downsizers should also be considered. In addition, incentives for institutional investors to develop affordable rental housing could also help manage the tax changes. Furthermore, removing surcharges for non-resident buyers could help with faster transactions and stimulate new dwelling supply. In conclusion, labor’s planned property tax changes will accomplish some of its stated objectives but could make the current housing affordability constraints worse for both buyers and renters. If you need property investment advice, contact a Chan & Naylor accountant near you, and we’ll be more than happy to help. Aside from property investing, have a look at our other accounting and advisory services that we do to help you achieve greater success. If you liked our “Labor’s Planned Property Tax Changes and Its Possible Effects On Property Markets” post, subscribe to our newsletter and stay in touch with us on Facebook, Instagram, and Twitter. Chan & Naylor Group has nationwide offices in North Sydney, South West Sydney, Sydney, Pymble and Parramatta in New South Wales, Melbourne, Moonee Ponds and Hawthorn in Victoria, Brisbane and Capalaba in Queensland, and East Perth in Western Australia that can assist you with your income tax as well as any property tax or business tax enquiry that you may have. Contact us today.